The Boxer’s most notable characteristic is his desire for human affection. Though his spirited bearing, square jaw, and cleanly muscled body suggest the well-conditioned middleweight athlete of dogdom, the boxer is happiest when he is with people. The boxer’s historical background began in feudal Germany. There, a small, courageous hunting dog with mastiff-type head and undershot bite was used to secure a tenacious hold on bull, boar, or bear, and await the hunter’s arrival. He later became a utility dog for peasants and shop owners. His easy trainability even found him performing in the circus. In the 1880s, descendants of this type of dog were bred to a taller, more elegant English import, and the era of the modern boxer had begun. Imported to America after the First World War, his popularity really began in the late 1930s. The boxer is a medium-sized dog ranging from 21 inches high at the shoulder in a smaller female up to 25 inches (sometimes even taller) in a large male. Adult weight may reach 65-80 pounds in the male, with females about 15 pounds less. There are no miniature or giant varieties. Boxers come in a range of colors from fawn (which may vary from a tawny tan to an stag red) to brindle (which can be so dark as to appear reverse brindle) to white. Boxers belong to the Working Group of dogs, and historically their naturally floppy ears were cropped (cut and made to stand upright) and their long tails docked short in order to enhance their performance as working dogs. Today, cropping and docking serve no functional purpose. Instead, these cosmetic surgeries are simply that – surgical alteration to make the dogs fit our preconceived notions about what is the “right” look for the breed. But the “right” look is only a matter of fashion – short-lived and changing. Once it was unusual to see a boxer with natural ears; now it less common to see one with cropped ears. Most of our foster dogs have docked tails, but almost anywhere you go in Europe, where cropping and docking are illegal, all of the boxers will be “au naturel” – with floppy ears, and long tails. Some people wonder: won’t a boxer with a long tail hurt you? Do Labradors, retrievers, shepherds, and the countless other breeds with naturally long tails cause chaos around them and injure loved ones with their tails? We think not. Other people argue that boxers with cropped ears look mean. It’s hard to maintain that belief when you see a smiling, wiggly, cropped-eared boxer greet you at the door, or snuggle sweetly on your lap. We ask you not to discriminate against dogs whose ears or tails are not what you expect them to be when you think of a boxer. Fashion is fleeting, but an eternal truth is that a boxer is a boxer is a boxer – sweet, delightful, and, most of all, deserving of our love. And one thing we can assure you is that whatever your boxer looks like, it will be beautiful in your eyes from the moment you love it. 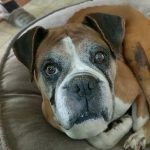 Boxers are clownish and playful, loyal and steadfast, courageous and protective, and goofy and stubborn, all rolled into one dog. This combination of temperament traits in conjunction with intelligence and a very expressive face, result in a one-of-a-kind type of dog. 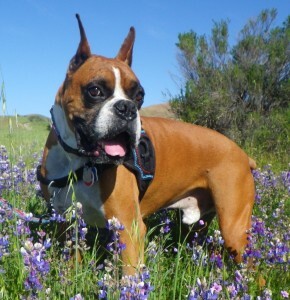 For more information on the boxer personality, visit our Boxer Temperament page. The boxer is a relatively low-maintenance dog, but ownership of any dog is a big responsibility. Regular veterinary visits and year-round heartworm preventative, general care, feeding and exercise are a must for your boxer. General care should include regular nail trimming, an occasional bath, periodic tartar removal from teeth and quality dog food. Exercise should include a daily walk or other stimulating and athletic activity. The boxer is sensitive to temperature extremes and does not enjoy drafts, summer heat, or cold. 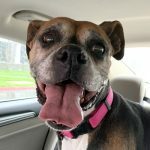 While some dog breeds can handle the temperature ranges and fluctuations of being outside for long periods, boxers are not so tolerant and should not be kept outdoors. Good nutrition is the hallmark of a healthy boxer. For a non-biased review of the quality of various dog foods, visit Reviews.com’s Best Dog Food Reviews and Ratings of 2015. Keeping your boxer safe from household hazards, including chemicals, tools and equipment, toxic plants and much more, is also important in the care of your pet. For more information on potential pet hazards in your home and yard, and how to avoid them, visit Expertise.com’s Home Safety Guide for Pet Owners. — Some of this information was prepared under the auspices of The American Boxer Club as part of its educational services to boxer breeders and owners.